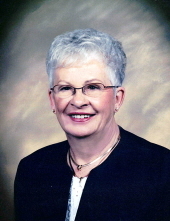 Patricia L. Ellerbusch - Vangsness, age 82, of Faribault died on Tuesday, January 22, 2019, at HCMC, Minneapolis surrounded by her family. Services will be Trinity Lutheran Church, Faribault on Tuesday, January 29, 2019, at 11:00 a.m. with the Reverend Paul Rieger, officiating. Spring interment will be at Maple Lawn Cemetery, Faribault. Visitation will be at the church for one hour prior to the service on Tuesday. Patricia L., the daughter of Andrew J. and Wilma R. (Dodes) McFadden was born on August 23, 1936 in Lonsdale. She graduated from Northfield High School in 1953. She married Howard Ellerbusch on December 29, 1953 and he preceded her in death on September 5, 2002. Later she married Leverne Vangsness and he preceded her in death on December 2, 2011. She was formerly employed by Faribault Woolen Mills, Heselton Construction, Faribo Manufacturing, the State of Minnesota and the Lavender Inn all of Faribault. She is survived by her children, Deborah (and Brian) Tuzon of Kauai, HI, Darla (and Steve) Matthews of Omaha, NE, Kurt Ellerbusch of Apache Junction, AZ, Maury (and Shannon) Ellerbusch of Mesa, AZ and Rae Lynn Ellerbusch of Faribault; 13 grandchildren; 11 great grandchildren; two siblings, Barbara Meyer and Sheila Roehrick of both of Northfield. She was preceded in death by her husbands, Howard and Leverne; and her parents. "Email Address" would like to share the life celebration of Patricia L. Ellerbusch-Vangsness. Click on the "link" to go to share a favorite memory or leave a condolence message for the family.